When searching for ancestors, one of the hardest things to do is find the ancestor that began your families history in America. My family and I have been searching for William Sweeny's father for quite some time. My cousin Tom Sweeny has been such a great help in this search and seems to be more educated in the history of John Sweeny than most. The document that has been a great guide to this search is the William Blizzard Sweeny, Descendant Information File (40 pages, Handwritten 1941) found on the files page of this website. One thought that comes to mind is the fact that William B. Sweeny had direct communication with Charles R. Sweeny, the son of William Sweeny. The document states that William Sweeny was born in Milford, Delaware and was a pilot on a sailing vessel. He died by reason of drowning. Earlier in his life William was a coach maker in Phila, Penna. 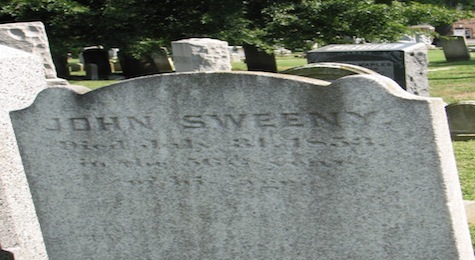 John Sweeny of Lewes, Delaware had an occupation of carpenter and also had a son that was a carpenter (Arthur West Sweeny). My cousin Tom Sweeny made a statement, "In the cases of the Conwells, Wests, Burtons & Blizzards (Captain William Henry Blizzard is buried about 20 feet away from John) all of these families produced a number of sea captains and river pilots." In the 1941 document with information on William, it states he was a pilot on a sailing vessel after being a coach maker in Chester, PA. William died in a drowning accident in Lewes, DE. A dad who was a carpenter (William's coach making skills) and friends that were captains and sailing pilots (William drowning as a pilot) shows that likelyhood that John is Williams father. John is listed as 56 years old at his death in 1853. That puts his birth at about 1797. The 1941 document states Williams father came over during the Irish Rebellion of 1798 as a "very young man." William Sweeny married Catharine Roe (b. 1822) in 1840. After examining the 1830, 1840, 1850 census records, I found that it their is slight fluctuation in the number of children in John's family. Some of the children shown in the 1850 census (first year names are listed) match up with the numbers show on the 1830/40 census, but some don't. William most likely would not show on the 1840 census because he moved to Darby, Penna. He would show in the 1830 as about a 10 year old male. Their is one on the 1830 that disappears on the 1840. Could this be William who had moved and married in 1840? It is very possible. Is this the same Sweeney family that Anna Sample Lee married into? I am a direct desendant of Anna (Annie) Lee. She married a Sweeney, first name unknown, and they had John Sweeney b:?- d:1853/54, who married Catherine Wheaton 1829-1895. John and catherine had Caroline Regina Sweeney who married Charles R. Glackin. If so, I'm related. Land sale John Sweeny and wife Jane, and David Rowland and wife Kitty, sell land to Baily A. West and Mary Ann West all of Lewis, Delaware. August 1, 1837. Formerly the property of Arthur West.